At first glance plastic is a wonderful invention. It can be made in any size, any shape and any colour we want, and is perfect for storing any number of materials and liquids, ranging from water to pesticides. 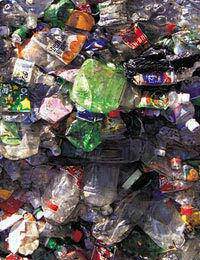 Plastic is also very cheap to make, and requires little resources to do so. But, how can we effectively dispose of it, particularly now that we have so much of it? Plastic has only been part of our world since the 1830's, when experiments with rubber and sulphur created vulcanized rubber. Charles Goodyear, of the tyre company bearing his name, was responsible for this. This experimentation continued with the addition of other chemicals, and cellulose and rayon were produced. Bakelite, said to be the first real form of plastic, was created through this experimental process, in the first decade of the 20th Century, and humankind has never looked back. The development of plastics really got underway intensely in the 1950's, and our consumption of the stuff, meaning our use of rather than our eating of it, currently stands at a 2000% leap since then, with an annual increase of about 4% on top of that. However, the disposal of plastic is hazardous – as solid waste it produces carbon dioxide, nitrogen oxide and sulphur dioxide – leaching into the soil. There are 7 types of recyclable plastic. PET (polyethylene terephthalate) with a triangular symbol is the most common, and this is generally used for bottled soft drinks and water, cooking oil bottles and some oven-ready food containers. Once the plastic has been collected, it is sorted according to its polymer type and colour, washed and cut down into smaller, more manageable pieces. The pieces are again sorted during a flotation process (where the heavier, unrecycleable pieces sink), then the remainder is dried and melted. This is then filtered to remove possible contaminates, then either squeezed into strands or chipped into pellets. Visiting a plastic recycling plant is a sobering experience : walking alongside vast pallets of bundled plastic. The company collects plastic waste, mainly only in bottle form, from hundreds of public collection points through Israel's main Cities. This is then transported by road to their remote plant, tucked inside a vast industrial complex, Ramat HaNegev, in the Negev Desert. The entire complex is a heavy pollution provider, and the local environment and (largely) Bedouin population is suffering, but that is a separate story. The plastic is sorted, goes through the process roughly described above, and then is chipped into tiny pieces. This then is either made into more plastic packaging or containers for the food and drink industry, or it is made into a type of wood-style hard material, which the company creates outdoor furniture from. A UK company, Belu, has recently started selling bottled Welsh water, contained in a corn-starch bottle, which is compostable. And the companies profits go to worldwide clean water projects. Find it in your local health food store, or ask your supermarket to stock it. Facilities remain limited in the UK, but some Councils now provide plastic bottle collection.Use this where possible, but most importantly, let’s reduce our use of polluting plastic!